It seems like side items are so hard to vary. How mnay ways can you cook vegetables to make it not so boring? 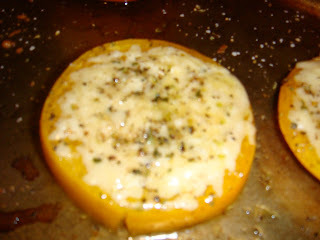 I decided to set out for a new side and came across these Baked Parmesan Tomatoes from eatingwell.com. They were really simple and had a lot of flavor. They almost taste like pizza! Each half is only 91 calories, which isnt too bad since it's a whole half of a large tomato and doesn't leave you needing more of a veggie. Place tomatoes sliced side up on a baking sheet. On tops, sprinkle parmesan cheese, oregano, salt and pepper. Top with olive oil and bake until tender, 15 minutes.